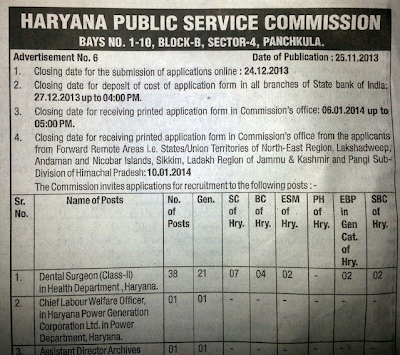 HARYANA PUBLIC SERVICE COMMISSION INVITES APPLICATIONS FOR THE POST OF DENTAL SURGEON. The ONLINE APPLICATIONS are invited from Indian Citizens for the posts of Junior Residents (Non-Academic) for January, 2014 session in DENTAL SURGERY in the pay scale of Rs.15,600/- + 5400/- (GP) per month plus all allowances including NPA, in the prescribed format and on the terms & conditions given in detail on Institute website – www.aiimsexams.org, www.aiims.ac.in and www.aiims.edu. Last date for online submission of application for these posts is 10.12.2013 (by 1700 hrs). 1. The Junior Residency (Non-Academic) will be provided first to all the Institute Graduates who full fill above eligibility criteria.